Rafael Nadal, Alexander Zverev, Kevin Anderson, Novak Djokovic and John Isner win their matches on a rain-interrupted Wednesday in Toronto. Four-time Rogers Cup champion Novak Djokovic escaped the rain on Wednesday afternoon with a 6-3, 6-4 second round win over Canadian Peter Polansky. The No. 9 seed from Serbia was in control of the encounter, didn’t face a break point and converted two of his own six chances to advance in one hour and 24 minutes. Djokovic is now 21-3 in his last 24 matches after starting 2018 6-6. Djokovic will nex take on Stefanos Tsitsipas. The #NextGenATP star from Greece upset No. 7 seed Dominic Thiem 6-3, 7-6(6). The encounter lasted one hour and 21 minutes. 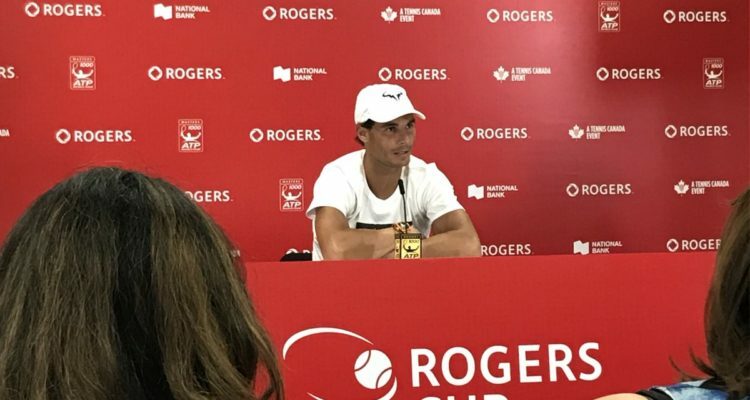 After the rain, it was a big day for the big names of the ATP Masters 1000 event in Montreal. Rafael Nadal, Alexander Zverev, Kevin Anderson and John Isner all booked spots in the round of 16. Top seed Nadal beat Benoit Paire 6-2, 6-3. No. 2 seed Zverev eased past US-American qualifier Bradley Klahn 6-4, 6-4. Fourth favourite Anderson had to go the distance against Evgeny Donskoy, winning 4-6, 6-2, 7-6(0) and No. 8 seed Isner beat Pierre-Hugues Herbert 7-6(3), 6-2. Persistent rain wreaked havoc on Wednesday’s schedule as showers moved over the Aviva Centre several times. Canada’s tennis legend Daniel Nestor has played in his 30th and final Rogers Cup. The doubles stalwart – a two-time champion here – paired up with countryman Vasek Pospisil in a three-set loss to Feliciano Lopez and Marc Lopez of Spain. Canadian No.1 Denis Shapovalov is looking for a repeat run from a year ago in Montreal. He beat No.14 seed Fabio Fognini in two tight sets. Stan Wawrinka earned another nail-biting win in what is a continued comeback for the Swiss player from knee problems. His reward? Nadal in round three. On his 18th birthday, home hope Felix Auger-Aliassime played a dramatic three-set thriller against Daniil Medvedev but fell short, the Russian winning in the third-set tiebreak. It wasn’t meant to be for another Canadian, Milos Raonic, who fought valiantly but was faded away in the third set against US-American Frances Tiafoe. Thursday’ schedule is packed: All eight round of 16 matches will take place, as well as a host of doubles battles, including No.1 seeds Oliver Marach and Mate Pavic. Anderson and Djokovic will take to the doubles court following their respective singles, teaming up for the first time. This entry was posted in ATP Masters 1000 Toronto/Montreal, ATP Tour and tagged ATP World Tour, Rafael Nadal, Rogers Cup, Toronto.